All My Life [Book Review] – my books. my life. I grew up watching All My Children. From a very young age, I knew that 1pm-2pm was time that we spent in Pine Valley. On the days that my mom was home with us, we planned our shopping trips, afternoons at the pool, and everything else around All My Children. When I went to college and I was home in the afternoons, I started watching it on my own. I even got my roommate into it. It wasn’t until law school that I finally stopped watching because I just wasn’t ever home. I haven’t watched All My Children in years, and with last week’s announcement that after four decades the show would end in October, my chances to do so are limited. Although I am no longer a loyal viewer, this news greatly saddens me. I always thought I would be able to return to Pine Valley. 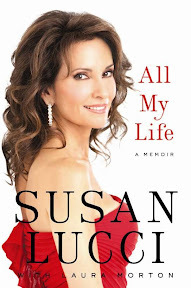 In one of those odd coincidences of life, I finished Susan Lucci’s audiobook, All My Life, two days before the announcement. And it was so good to be back with an old friend. Susan Lucci has played Erica Kane for 40+years, a feat few actors can match. Throughout it all she has maintained a private and successful family life. While Erica went through husband after husband, Lucci has been with the same man. She raised two kids (largely out of the spotlight). Learning about her work-life balance was one of the more fascinating aspects of All My Life. The book opens on the night Lucci finally wins her Daytime Emmy, after 18 nominations without a win. It is a great way to pull in the reader. After that, it largely goes in chronological order. Her childhood, college, the early days of All My Children, etc. Any fan of the show will enjoy the references to the different AMC storylines throughout the novel. If you, like me, are in mourning over the loss of All My Children, pick up Susan Lucci’s memoir. You’ll enjoy the journey. The narration, of course, is excellent. Lucci is so down-to-Earth despite her success and puts so much feeling into her story. I definitely recommend the audiobook. I was wondering how this was! I never watched AMC that much but did now and then. I still can’t believe it’s over though! Sounds interesting and nostalgic! I don’t watch All my Children, but I do watch General Hospital everyday while I am exercising and can’t imagine how upset I would be if it suddenly went off the air. I probably would get a lot more audio books listened to, that’s for sure! You know, I never watched this soap. I did the Young and the Restless, Bold and the Beautiful, and As the World Turns rotation (mostly in high school and college). But you have to hand it to Lucci. She was in for the long haul, and she sure does look good for her age. She was just on GMA or something like that recently, and she gave a good interview. It’s so sad isn’t it? I grew up watching the soaps with my mom. I think I’ve seen pretty much every one at this point over a period of time. It’s been a long time since I’ve watched AMC but have remained (until recently) pretty faithful to GH. I’m sure it’s the next to go. Glad you enjoyed this book it’s a timely read for sure. I’m saving this book for a day when I need a light, relaxing read. She was SO nice when I met her in person–the warmest, friendliest famous person I’ve ever encountered.